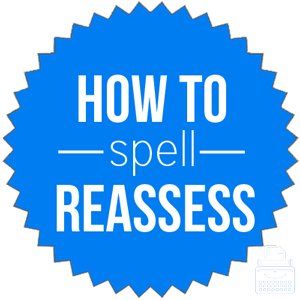 Spelling of Reassess: Reassess is spelled r-e-a-s-s-e-s-s. Unlike obsess, reassess has double “-s’s” in the middle and at the end. Definition of Reassess: Reassess means to assess something again. Before making a decision, one might reconsider—or reassess—the facts and the situation a second, and perhaps a third, time in order to avoid making an error or poor decision. Pronunciation of Reassess: Reassess is pronounced ree-a-sess. What does reassess mean? Reassess is a verb. It is the act of assessing a decision, action, or situation a second time before proceeding. Before we purchase this house, I think we need to reassess the pros and cons. We will reassess the situation after we get the answers to these questions. By adding “-ment” to reassess, the noun reassessment is formed. Reassessment refers to the actual process of reassessing something. If there has already been an assessment but, for whatever reason, another needs to be done, we would call that a reassessment. The first assessment was not conclusive, thus we must conduct a reassessment of the findings. I want you to come back in two weeks for a reassessment to see if you have improved at all by then. While there are no phrases or idioms that make use of the word reassess, there are some phrases that are synonymous with the word. According to Merriam-Webster’s, reassess was first used in circa 1689. Reassess comes from adding the prefix “re-“, again, to the word assess, which comes from the late Middle English word assessen, from the Medieval Latin word assessare, meaning to assess a tax. The latter is derived from the Latin word assessus, meaning seated beside (a judge). There are several synonyms for the word reassess, however, some are more for specific situations. Reassess is a verb that is formed by adding the prefix “re-” to the verb assess, meaning to assess (something) again.